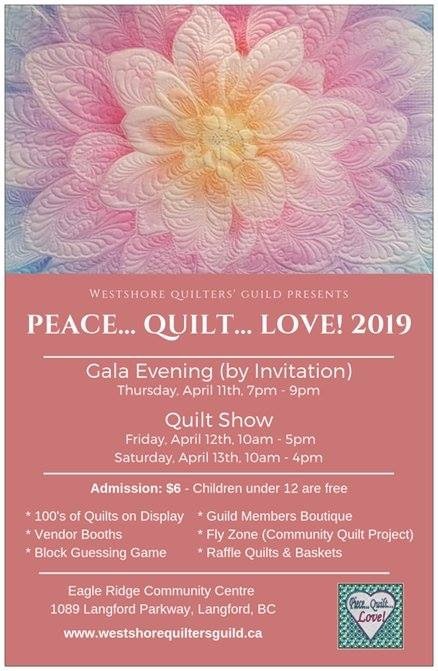 The next Quilt Show meetings will be held in the Quality Foods upstairs Boardroom, the wrap up meeting will be Wed May 1st at 6 pm upstairs in the meeting room at Quality Foods Supermarket in the mall on Helmcken Road. We went over committee reports one by one of those who were present. Pincushions: Please continue to make the pincushions – we appreciate it so much!! Tami has lots of kit available at every meeting – please feel free to take as many kits as you can make. We always need LOTS! Please continue to make the pincushions – we appreciate it so much!! Raffle Tickets: will be coming out soon and we are always looking for donatons for our popular rafe baskets. Gala has submitted a budget and are currently researching invitation options. There was a question of whether Food Safe applies to us. Jan is looking into that. Invitations will be available for the November meeting, and sign up for baking will start after Christmas. Advertising is coming along. Marquee and Library display is booked. Darlene is putting together her timelines to get all the advertising out. If you are out and about in BC and would like to spread the pincushions/posters etc around to the shops, please contact Darlene or Tami. Guild Challenge: See Challenge page for more info. Block Challenge: all blocks are out (due Dec. Meeting) See Challenge page for more info. Predisposed to UFO Challenge: 31 UFOs will be proudly displayed (if they all cease to become UFOs) See Challenge page for more info. Raffle Baskets: Chris Troubridge will be looking for us to help her fill the raffle baskets. So far we have 3 generous donations: everything you need to paint a room except the painter, by Julie Matear. And a piece of photographic art and a make- up basket, by Darlene Masson. Please contact Chris or Nina if you have anything you would like to contribute. We discussed putting together a CD of previous quilt shows to have for sale. We’ll get back to that idea at another meeting. We discussed how the voting for categories might work and put forth 2 options: having a panel peruse the quilts or have the WQG membership vote. We put the options before the membership at the August meeting and the overwhelming preference was for WQG membership voting the night of the Gala. Best in Show will be by public vote during the show. A HUGE Thank You!! to everyone who is stepping forward to help with the planning and preparation of the quilt show. It is simply not possible without a huge cadre of committed volunteers. For those of you who do not wish to serve on committee but wish to volunteer at the show, Diane Sanci and Sue Sharock will be coordinating that list in the new year. If you wish to serve on a committee, please contact either Cathy or Allison and we’ll put you in touch with the rest of the team. There are quite a few committee that need some assistance.